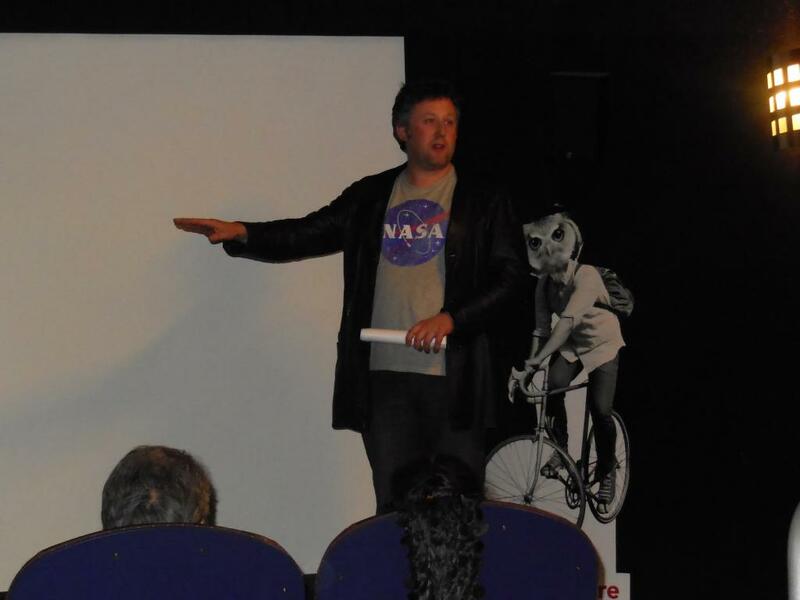 The second Saturday of the festival was UK day, with three British features on the original schedule to go along with a visit from sister festival Sci-Fi London. That's not how it turned out - OXV: The Manual was apparently sent over on a Region B blu-ray that nobody had the equipment to play, so we got a series of 48-hour-film-project shorts instead. There were also rescheduled movies for the 9pm hour - Who's Changing at 9 in the screening room and non-British entry Coherence in the big theater at 9:40. I considered the latter, but didn't feel like waiting around an hour for something that wouldn't have me in bed until almost midnight with a round-the-clock marathon looming twelve hours later. Besides, even though this was to be the screening that co-star Nicholas Brendan was going to be at after being snowed out on Thursday, another bit of winter weather put the kibosh on that, and since it was going to be in the marathon the next day... Well, might as well get some sleep, right? He had a number of good stories, though, including just how he got a tank for the opening scenes of the movie. Both of the day's British visitors (including London festival director Louis Savy) were voluble, enthusiastic folks, and Sci-Fi London certainly an event I'd like to hit up sometime, although this year it's right up against IFFBoston, even if I could swing a trip to London on short notice. I'll probably do it one of these years, though - I would love to visit the city again, with a week of sci-fi movies being a bonus. This movie played the festival under the name "Armistice", but IMDB lists that as an alternate title to "Warhouse". Both are kind of silly titles; the first is blandly generic but still needs to be stretched to refer to this movie; the second is almost absurdly literal. That I can't come up with something better probably indicated that there's just not as much of interest here as one might hope. It starts with A.J. Budd (Joseph Morgan) of the Royal Marines waking up in an apparently-normal house, presumably finishing up leave and about to report back to active duty. He soon find that it is impossible to leave the house, though, even before some sort of monster attacks him with murderous intent. The next morning, it becomes clear that this is a cycle, and even when he find the journals of Edward Sterling (Matt Ryan), another soldier previously in the same situation, that's not exactly the same as an explanation. Armistice is a short movie, just long enough to be considered feature-length at seventy-five-ish minutes, but is thin on plot even at that length, with Sterling's nearly-identical story nested within Budd's helping to stretch it even that far. To the credit of director Luke Massey and co-writer Benjamin Read, this doesn't particularly feel like padding or even a shortcut that keeps Budd from learning about his situation on his own; it underscores how the situation is an endless loop and the lack of explanation helps keep it solidly in the realm of horror. Plenty of sci-fi and fantasy stories take great care to suggest that they take place in the world we know, just out of sight, but is that always a good idea? Our world is often filled with heartbreak and sadness, and while they co-exist with whimsy and joy in reality, putting both the fantastical and the tragically true in the same work of fiction can make for a real mess. It eventually comes very close to sinking The Search for Simon, to be honest, as a movie that had been kind of precariously balanced anyway attempts to stretch too far in too many directions. As it opens, David Jones (writer/director Martin Gooch) has been searching for his missing brother Simon ever since he disappeared thirty years ago, when the two were young boys. David, for reasons both absurd and reasonable, believes Simon to have been abducted by aliens, and when he shares this with writer/psychiatrist Eloise Eldritch (Noeleen Comiskey), she acts interested, although mostly as a template for an obsessed character in her next novel. Eloise does wind up introducing David to a nice girl, Sally (Millie Reeves), although talking to David's alcoholic mother Irene (Carol Cleveland) may provide more answers than the various trips David goes on to UFO hot spots. The Search for Simon doesn't start off as a great movie, but it does at least seem to have a sense of what it is: A kind of black comedy where nearly everybody acts mockingly or patronizingly toward David, and it's okay to laugh at him because he persists in being so ridiculous. It's kind of mean-spirited, perhaps, but it's got some good gags, and Gooch manages a balance between making his main character sympathetic and ridiculous. It's probably not a balance that could be maintained all the way to the end - Gooch is inevitably going to have to make David face some uncomfortable facts or be improbably correct - but the film has enough good bits to score at a decent rate. It's got some big dead spots and some nerd-baiting humor, but most of the jokes work. Hi Jay - Thank you for your review! Sorry if you felt the hand outs were too 'industry' But they were copies of the BFI handouts from london, so blame them! It's a long way from London To Boston and I'm an independent film maker so I have to make some money somewhere! Glad you made it to the end of the movie!